I know some of you will have seen this story before on flickr, but it was a long time ago so thought it worth sharing with my WordPress and Facebook friends. It also allows me a little extra time on my next story for which I’m finding difficulties in illustrating! The star of this photograph just has to be the white vessel made of a rubbery type white plastic which we knew as “the Sick Bucket”. I was not sure when this humble object entered our lives but seem to think it was always there, waiting for an opportunity to be forced into receiving the contents of our stomachs! In reality the bucket probably dates from this period and my father had bought it for camping. He had purchased the “Igloo” tent and borrowed a small tent for my brother and myself to sleep in; a small paraffin stove and a vintage Tilley lamp were also acquired. I don’t know when the bucket was first used for unwanted stomach contents, but I can tell you that once used, the smell never went away, no matter what was placed in there from thence forth it still smelled of sick, if you felt unwell just one nostril full of that and there was no effort, up it came! Years later it still lurked in the garage, but by now it was being used for a variety of purposes, I remember all the wallpaper paste we used up for our twenty-plus room house in Southerndown was mixed in there – and still it smelled of . . . .
I’d like to be able to tell you I still have that bucket, but sadly I can’t find it, my sister says it’s not in her garage either, so it probably went in one of the eight skips we needed when we moved from Southerndown six years ago! I’m still not convinced though, will let you know if it turns up! Oh, by the way, the date is August 1961, I was twelve and the location is a private field near Derwent Water in the Lake District. There was another lone camper in the tent behind ours. 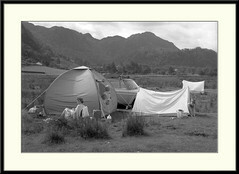 My brother never did sleep in the small tent, it was only just big enough for me! The car is an Austin A40 Countryman, pale turquoise, registered 717 KTG. The photographer is my father and he was using a mid 1950s folding camera of German origin, a Balda, which took 12 shots on conventional 120 film. The lens on this camera is extremely sharp but having a non-coupled rangefinder is extremely fiddly to use banishing all thoughts of spontaneity. I still have that camera but haven’t used it for about twenty years.